Recent Dio Old Girl, Libby Johnston, is now one giant step closer to achieving her dreams of Broadway stardom, after being awarded a Presidential Scholarship of up to US$80,000 at the prestigious Manhattan School of Music. Selected from over 3,000 auditionees, 18 year old Libby will move to New York later this year to commence her Bachelor of Music in Musical Theatre. Libby says she can’t remember a time when she didn’t want to perform. The highly talented youngster not only acts, sings and dances, but also plays the piano and the viola. She says her biggest highlight was playing Liesl von Trapp in the New Zealand national tour of “The Sound of Music” in 2017 and she has a list of performing achievements to her name - being awarded the Best Performer in the University of Otago Shakespeare Festival in 2017; and being the Under 18 Champion of the New Zealand Aria Competition in 2016. She was also the leader of Dio’s elite choir St Cecilia Singers in Year 13 “which was a dream come true as choral singing and The Big Sing competition was a hugely significant part of my identity throughout high school”, says Libby. Talent runs in the family and Libby will be performing with her younger sister, Hattie, in the National Youth Theatre Company’s production of Andrew Lloyd Webber’s “Cats”, and will be playing the lead role, Grizabella, on the closing night (Saturday 23rd June at 7pm - tickets on sale via Ticketmaster). Libby has already had a taste of New York life, after spending three weeks in the city as part of the American Musical and Dramatic Academy (AMDA) high school summer programme in 2015. The highly talented youngster was also accepted into Boston Conservatory at Berklee, Elon University, Pace University, Marymount Manhattan College and the American Musical and Dramatic Academy but chose the Manhattan School of Music primarily because of the fact that it’s a music conservatory, not a college. Well done Libby, a great example of Dio girls going places! 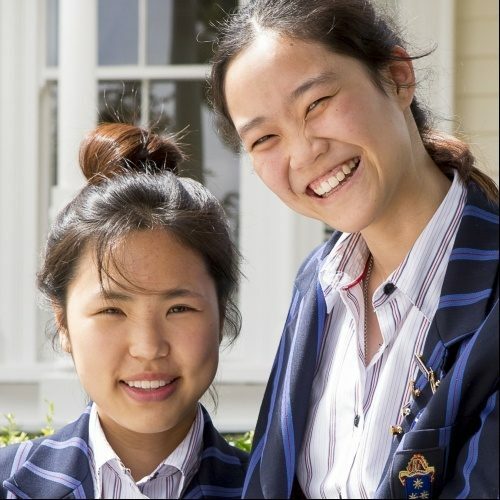 International Student Representative Yuri Kim talks to us about why she chose to leave friends and family and travel to NZ and study at Diocesan.